Now that the weather has finally turned into autumnal coolness here in Southern California, we can start using our oven again. You guys- we had a HOT, LATE summer, with one of the hotter heat waves I can remember hitting us right up until the end of October. It was brutal! Most of us here have old homes (walking distance from the beach) with no air conditioning. We never needed it. Sure there were a few days here and there you wished you had one, but a few fans and the windows open, and you survived. Now though, you need one to feel like you can live. Its HOT! Luckily we invested in a portable window guy a few years back when it first started reaching 100+ temps, and man is it a lifesaver. That being said, when it gets that hot, stoves and ovens just aren't turning on. AT ALL. But now the ocean breeze is back, the air is cool and sometimes even crisp, and we're feeling all the fall vibes. That feeling trickles into dinner as well. Soups, stews, hearty rich dishes, and lots of one-pan baked meals are all our jam now. 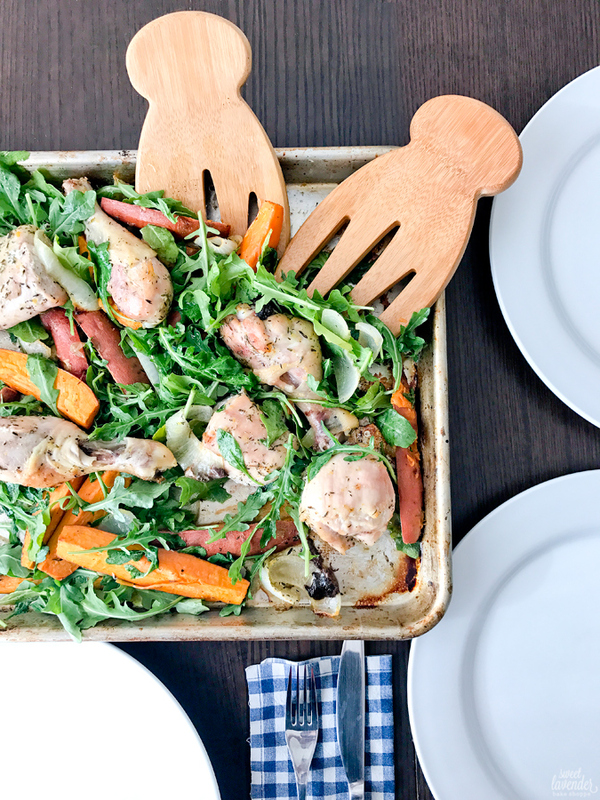 This one- this roasted chicken and veggie dish with lemon and thyme: ranks right up there on the top of my list. It's comforting and so easy to make, and using just one pan for everything- boom, easy clean up. Feel free to switch up citruses and/or herbs to suit your mood. But I promise you that the thyme and lemon combo is a good one! 2. Place sweet potato wedges and onion into a large bowl, set aside. 3. To a smaller bowl, make a paste out of the olive oil, salt, thyme and lemon zest. 4. Pour 1/2 of the paste onto the vegetables and toss/mix well with hands. 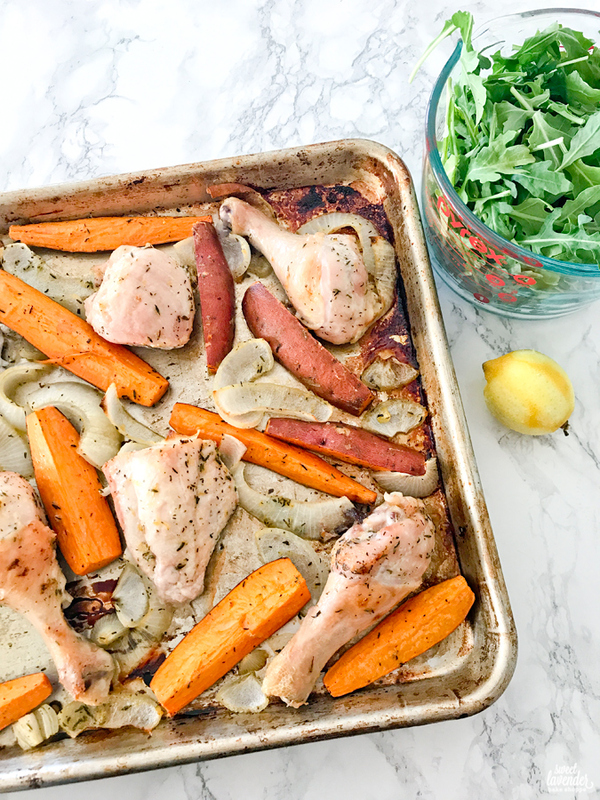 Place vegetables around a sheet pan so that everything is in one even layer. 5. 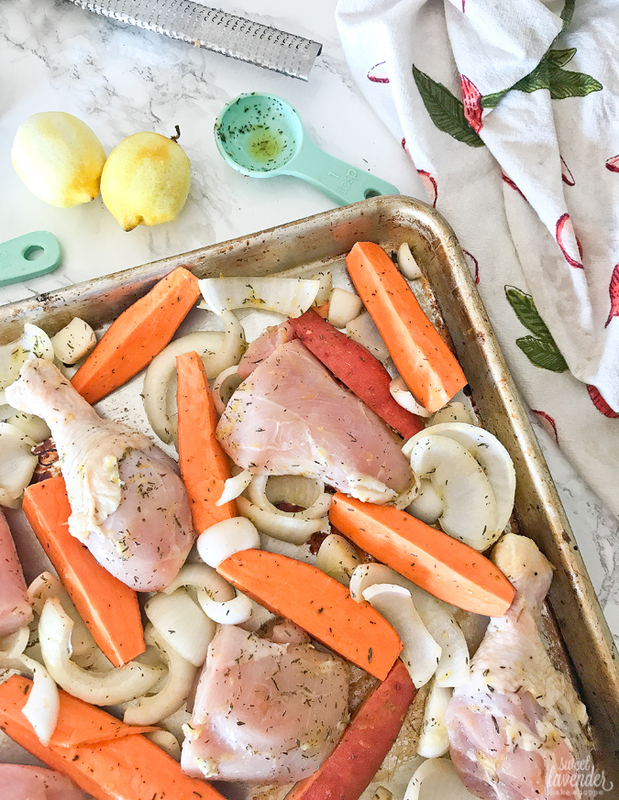 Cut each breast in half (so that you have 4 breast pieces total) and add all your raw chicken pieces to that same large bowl used for the veggies. 6. Pour the remaining 1/2 of herb paste over the chicken and massage into all the pieces with your hands. 7. 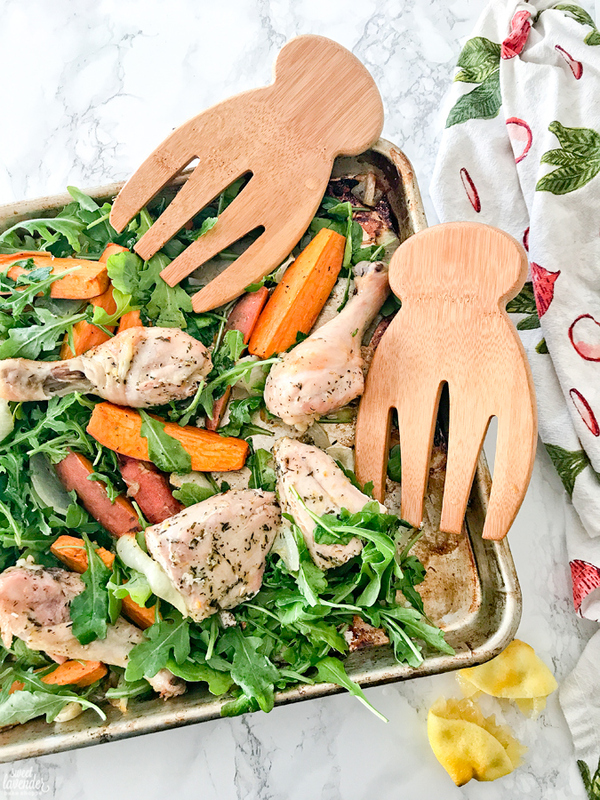 Once fully coated, spread chicken pieces around your sheet pan, nestling in-between veggie pieces. Allow chicken to touch the bottom of the pan (this will get the bottoms some color too). You are wanting (as much as possible) everything to be one single layer, so that the chicken and veggies roast and not steam. Which could happen if things were on top of each other. 8. Roast in preheated oven until chicken and veggies are cooked through (chicken needs to be about 160°F internally)- about 50 minutes. 9. Once cooked, take pan out of oven and immediately toss with arugula and the lemon juice from the lemon(s) we zested earlier. Serve on pan with more salt as needed!